The Princess and the Frog. FINALLY. A fairytale: Me and Mr. B getting approved for a 4% interest rate mortgage and closing on a house. And living. TOGETHER. Guess what? 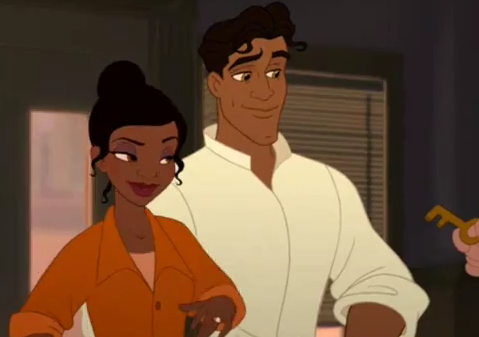 I finally saw The Princess and the Frog back when men were men, women were women, and my commute was 25 minutes on the Metro. I’ve written about it earlier but didn’t have a chance to review. Let’s start with a clip from Dr. Facilier, shall we? I’m a Disney kid and I’ve been raised on Disney, so it’s only natural that I had high expectations and hope for a continuation of the company’s early 1990s Golden Age. Even as I was enjoying the movie, I was mentally comparing to other cartoons, and maybe that’s something I wouldn’t have done if I were younger. Women don’t want to have children but want to pursue their dreams of being foodies and don’t need the help of men to get there. How beautiful New Orleans and jazz and Southern culture is, without patronizing it, introducing it to a whole new generation. Hot men with vague European accents that love you no matter how you look are compatible with feminism! (spoiler for the end of the movie, also spoiler for this blog) Also, women can build stuff! Voodoo culture. So much so that it piqued my curiosity and I spent the whole evening reading about voodoo. Unfortunately, this ancient and mysterious practice has nothing of interest for Jews who would like to conjure up currency. Awesome characters, including a jazz-playing alligator. LOTS OF TEACHABLE MOMENTS. And I don’t mean for little kids. I mean for me. I had to google Charlie Parker after seeing this movie. Anyway, I thought this movie was awesome. Not like Beauty and the Beast awesome, but a solid 7. I am relistening to all the music as we speak.